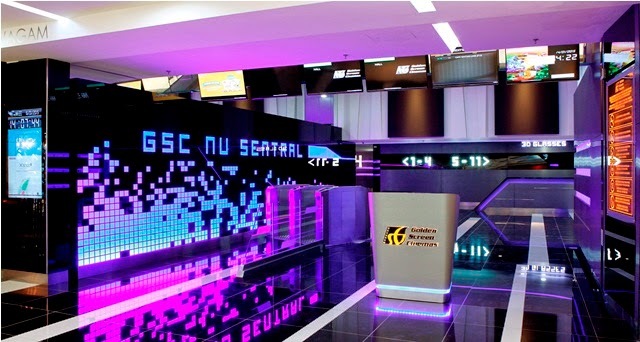 GSC will be launching its 30th location on the 5th floor in NU Sentral Mall this Thursday, which is an absolutely great news for those who’re at KL Sentral Station at all, and the residents in Brickfields. 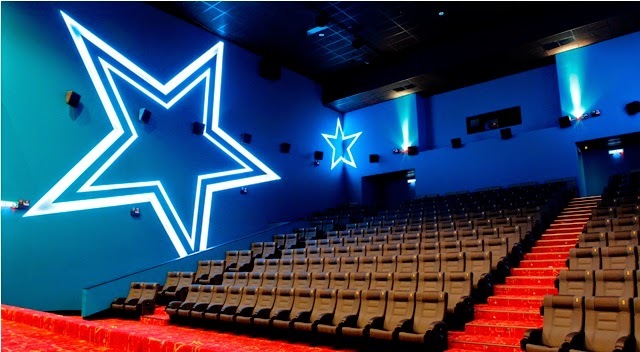 The new cinema features 11 fully digital screens which includes three 3D halls and a hall equipped with THX and Dolby Atmos system. 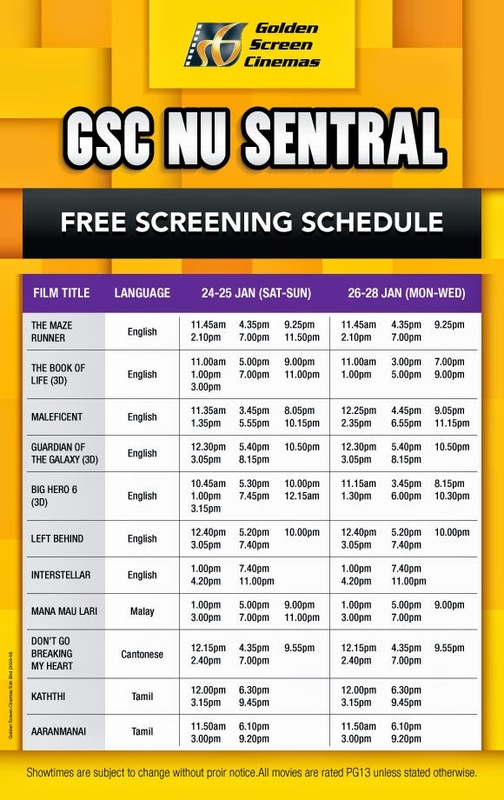 To celebrate the opening, GSC Nu Sentral Mall is currently having free screenings until this Wednesday 28 January. You will need to print the coupons that can be obtained from GSC’s website or Facebook Page as well as Nu Sentral Mall’s Information Counter on the Ground Floor. Simply present the coupon at the GSC NU Sentral box office counter from 10am onwards to redeem 2 free movie tickets (for the same day only). Redemption is limited to 2 coupons for a maximum of 4 tickets per person, and available on a first-come, first-served basis while stocks last. If you’re keen to go, I’d advice you to go on the weekdays as I heard the queue was very long yesterday and today. 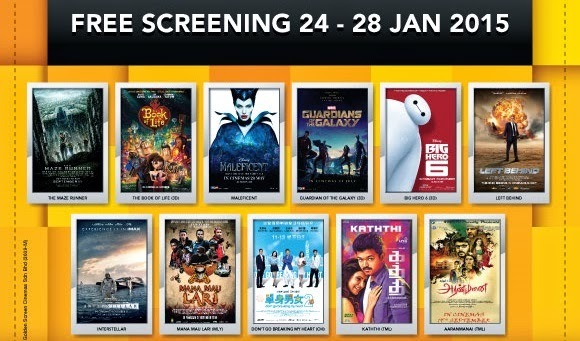 The films that are being screened for free are “Maze Runner”, “Book of Life (3D)”, “Maleficent”, “Guardians of the Galaxy (3D)”, “Big Hero 6 (3D)”, “Left Behind”, “Interstellar”, “Don’t Go Breaking My Heart” (Cantonese), “Mana Mau Lari” (Malay), “Katthi” (Tamil) and “Aaranmanai” (Tamil). As part of the opening promotions, there will be cash vouchers from Sakae Sushi and Simply d given away to customers who purchase a pair of movie tickets at the cinema box office whilst every purchase of popcorn combo 3 will receive a free 350ml bottle of Minute Maid Orange Juice, while stocks last. There will also be movie-themed activities throughout the opening weekends and public holiday from 31 Jan to 8 Feb 2015, between 12 noon to 9pm.